A Gillette system razor or a fashionable, traditional safety razor? Gillette Mach3 — 3 blade cartridge offering a close, comfortable shave. Gillette Fusion — 5 blade cartridge offering an extra close, comfortable shave. Fusion cartridges typically last longer than Mach3 cartridges. Replacement Gillette Mach3 and Fusion blade cartridges are available to purchase from leading supermarkets, pharmacies and online men's grooming stores. Gillette Fusion blade cartridges attract a higher purchase price. Safety razors are considered the old-school style of razors and a revival in their use has become the fashionable way again, to enjoy a wet shave. Using a single double edge blade a very clean, close shave is accomplished. Replacement blades are very inexpensive compared to Gillette blade cartridges. Read more in our detailed safety razor article to understand why many men are now shaving the traditional way. What does each razor type look like? Gillette Mach3 — 3 blades in the plastic cartridge and a small round release button which pops the cartridge out of the razor head. Gillette Fusion — 5 blades in the plastic cartridge with a wide, lozenge shaped release button which pops the cartridge out of the razor head. Safety razors — No plastic cartridge, a single double edge blade is used to shave beard growth. Safety razors simply unscrew into three peices ready for blade insertion. What is the cost per shave? Safety razor double edge blades: Very, very cheap. A pack of 10 typically costs only one British pound (one and a half US dollars) and yield easily 25-30 shaves per pack of 10. Gillette Mach3 cartridge blades: Cost around £1.50 per cartridge (a couple of US dollars), sold in packs of 4 or 8 with each cartridge lasting up to 6-8 shaves. Gillette Fusion cartridge blades: Cost around £2.50 per cartridge (just over 3 US dollars), sold in packs of 4 or 8 with each cartridge lasting up to 8-10 shaves. The Wilde & Harte 'Osterley Collection' Gillette compatible Mach3 cartridge razor in razor stand. Why Purchase from Wilde & Harte? Our razors are designed and manufactured in Britain. We are proud members of the MADE IN BRITAIN campaign. 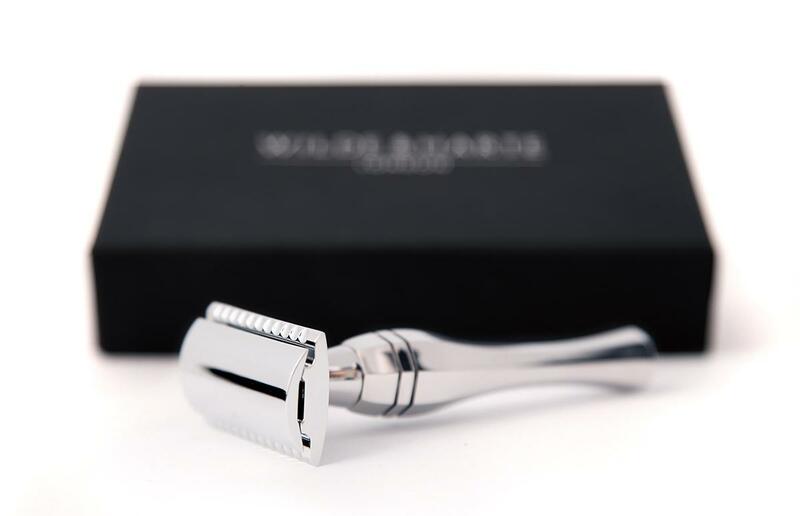 Each razor is polished to an impeccable mirror finish by skilled stainless steel finishers. Each razor is sold in a premium, foam fitted handmade gift box. You may also purchase razor stands and leather pouches for your Wilde & Harte razor. Furthermore, we also ship worldwide at very competitive rates. 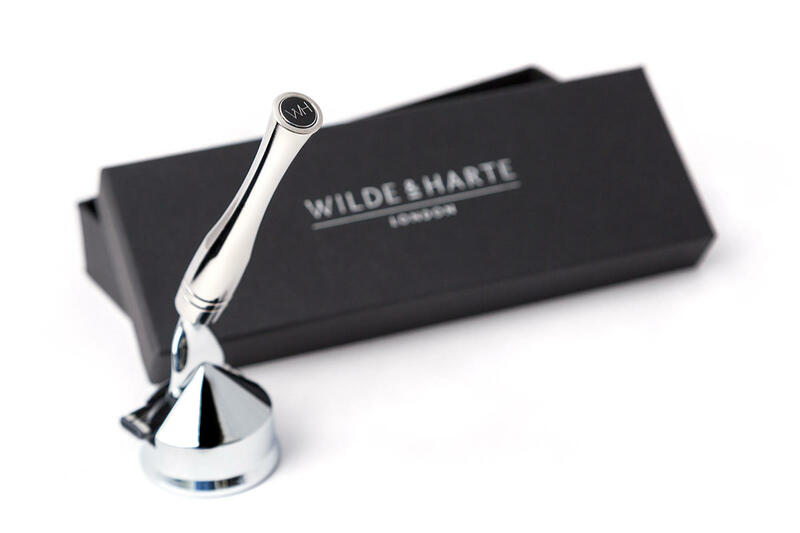 The Wilde & Harte 'Eltham Collection' single blade, double edge safety razor.